Years ago, when I was 19 years old and had just moved to Vancouver from a small interior town in BC, the first job that I landed was waitressing at White Spot in Kerrisdale. One of the best parts about working at White Spot was that the kitchen didn't produce the desserts, the waitresses did- and I loved putting something together that would elicit wide eyes when I presented it at the table. One of my favorite desserts at White Spot was the hot fudge brownie-dense, chocolatey brownie, topped with vanilla ice cream and drizzled with hot fudge. Who could resist that? In fact, 20 years later, the hot fudge brownie is still on White Spot's menu. A few days ago I had made coffee ice cream, and then still itching for something even more decadent, I baked some brownies. 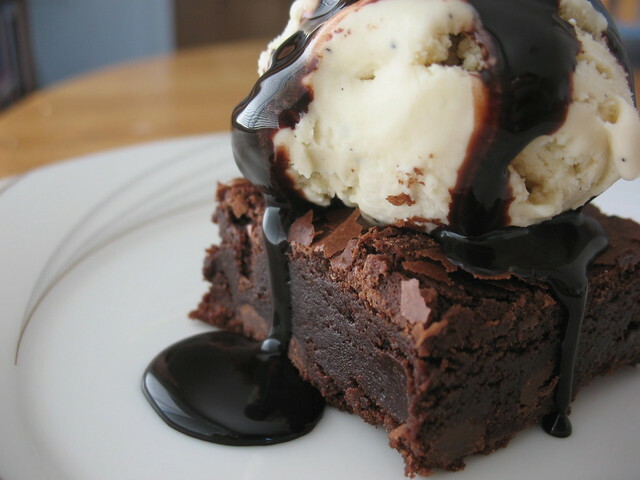 Sometime yesterday after supper, I finally remembered the White Spot fudge brownies. There was leftover chocolate fudge swirl in the fridge from when we made mint ice cream, and so I grabbed a bowl, put it all together, and handed the bowl to Kevin. His eyes widened as he gave a squeal of joy, then slowly, deliberately, ate every last bite. If you make anything on this blog, you must make this. The coffee ice cream tastes like a latte, the brownies are dense and hold up to the ice cream well, and the fudge sauce is perfect. If coffee ice cream isn't your favorite flavor, then use this vanilla one instead. If you don't have an ice cream maker, then buy the best ice cream or frozen yogurt you can find. All three recipes come from David Lebovitz's book The Perfect Scoop. I know, I know-I've been extolling the virtues of this book for awhile now, but you must know that it is well worth buying if you own an ice cream maker. If you don't have an ice cream maker but you love ice cream, I highly recommend that you run out and buy one, AND buy this book to go with it. Besides the basic directions, David gives you tips on how to create a perfect ice cream custard, and dispenses advice on everything from ingredients to equipment and ice cream makers. The recipes aren't limited to ice cream either, but include sauces, add ins like home made mint patties, and everything from cookies to brownies and how to make your own ice cream cones. I will dare to say that it is the ONLY ice cream book you'll ever need. All three recipes that are following are adapted from The Perfect Scoop. Now go buy that book, already. First, you will need to get a 9x9 inch square pan and line it with foil, then butter the foil. Make sure to use enough foil so that you have some overhang, which makes things far easier when you need to lift the brownies right out of the pan. In a medium sized saucepan over low heat, melt the butter and chocolate together, stirring constantly, until smooth. Set aside to cool slightly. Stir in the sugar until well mixed and then whisk in the eggs, one at a time. Add the vanilla. Stir in the flour and salt, continuing to whisk well. It's recommended in the original recipe that you "beat the batter vigorously for 30 seconds, until it begins to form a smooth ball". I didn't actually do this, to be honest, but I did give it a good whisk. Fold in your chocolate chips and nuts, if using. Scrape into your prepared pan and smooth the top before setting it in the oven. Bake for about 30 minutes, or until the center is just set. Remove them from the oven and let cool before lifting from the pan, peeling off the foil, and slicing up. These brownies will last about 3 days on your counter, wrapped well in cling film or if you leave them in the pan and wrap it with foil. They are also excellent crumbled into ice cream or served topped with a scoop and some sauce. In a medium sized saucepan, stir together the whole coffee beans, milk, sugar, salt, and 1/2 cup of the cream. Warm the mixture up (don't boil it), and then remove it from the heat, put a lid on, and let it sit for an hour at room temperature and steep. Get a large bowl, pour the remaining cup of cream into the bowl, and set a strainer on top. You are going to need it later to strain your custard, and it's a good thing to have it all ready to go before you start. Set aside. While you are at it, get a bowl of ice water ready that is big enough for the bowl that is holding the whipping cream to sit in. Later on you are going to need to sit that bowl holding the whipping cream and your finished custard in the top of the ice water bath and stir to cool it down. Not huge mind you, but enough that the bottom of the bowl holding the whipping cream will touch the ice water. You will want to stop the cooking process and make your custard cool quickly. Set aside. Crack your eggs and separate them, tossing the whites (unless you have something you can use them for) and keeping the yolks in either a large pyrex measuring cup or a medium sized bowl. Whisk the egg yolks together and keep them near the stove. Re-warm the coffee infused milk in a medium sized pot over medium low heat, stirring constantly. (don't let it boil!) When it's good and warm, gently pour a little into the eggs, whisking well as you go. Add the milk little by little, whisking constantly, until it's all incorporated. You have to be careful here, just adding the milk little bit by bit, and whisking things really well as you go. What you are doing is tempering your eggs by adding it bit by bit. Otherwise the hot mixture would just cook the eggs. Ew! Now that your eggs and warm milk are all mixed together, you need to cook the custard a little. Pour the mixture back into the saucepan and cook over medium low heat, stirring constantly, until the mixture will coat the back of a spoon. (the temperature of the finished custard will be between 170 C - 175 C) again-don't let it boil! To test if it's ready or not, run your finger across the back of your spoon. There should be a definite line that doesn't fill right back in right away. Remove the pot from the stove, and pour the mixture through your strainer into the bowl with the remaining cup of whipping cream, stirring. This is to catch any eggy bits that might be in your custard, and to get out the coffee beans. Press on the coffee beans to get out as much coffee goodness as you can. Nestle the bowl onto your bowl with ice/ice water, continuing to stir so that the cooking process is halted and the custard is chilled quickly. Mix in the vanilla and ground coffee. When it is cool, pour the custard into a container and chill overnight. You could probably chill it for less time, but I find that overnight gives you a better result. Process your ice cream according to your ice cream maker instructions. Maybe this was just runnier because I didn't do it right, but there was a little leftover from when I made Mint Ice Cream so I just spooned it on top. Delicious! In a medium saucepan, whisk together sugar, corn syrup, water, and cocoa powder over medium heat. Keep whisking it constantly while you heat it up, and the edges start to bubble. Bring it to a low boil, still whisking. Let it cook for 1 minute, whisking only occasionally, now. Take it off the heat and chill in the fridge. You can, once it's chilled, layer in with ice cream when your ice cream is finished processing in the machine and you are putting it into a container. Just spoon out some fudge ripple and plop spoonfuls here and there while you transfer the ice cream. Don't mix it. Mine didn't go super thick, so I used this as a topping for my brownie sundaes. Either way, it was delicious.